Receive a Finisher Medal, Flashlight and a T-shirt. 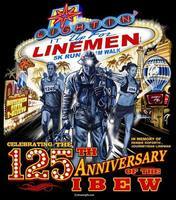 The Second Annual Lightin' It Up For Linemen, Flashlight run and walk at Craig Ranch Park. You will receive a flashlight to light your way through a beautiful course at Craig Ranch Park. All paid participates will also receive a T-shirt and finisher medal. Men and women across the country will join together to run this flashy flashlight event to spread awareness and raise funds for injured and fallen lineman who bring light to our lives. The National Sister United of Journeyman Linemen is a 501(c)(3) nonprofit organization, dedicated to assisting families of fallen or injured International Brotherhood of Electrical Workers, Journeymen Linemen, Utility Linemen, Apprentice Linemen, Groundmen, Operators, LCTT and/or their spouses and minor children. At NSUJL, we believe that no brother/sister or their family is to be left behind. This event is to memorialize our fallen electrical line workers, and care for the families who have lost or are impacted by a severe injury of a loved one in the line of duty. Friday, November 18, 2016 – Registration is 9:00 a.m. to 8:00 p.m. at NV Energy, 7155 Lindell Rd. The race lights up at 5:30 p.m. at the Garden Lodge at Craig Ranch Park. This will be a single loop course with lit up stations to help guide you to the finish. The 5K will be timed and the 1 mile walk will not be timed but every participant will receive a finisher’s gleaming medal, flashlight and T-shirt*. Bib numbers are non-transferable and must be worn by the person assigned to the bib. Make sure to bring your strollers and children for the 1 mile walk to storm this event and win an award for the best lite-up stroller. Awards: Speed of lightning awards for the 5K Overall 1st place male and female. Ribbons of radiance for 1st place in each age division, male and female. Safety First: Wear your flashiest headlamps, lights, reflective vest and stickers, light apparel and/or rave attire. Please keep it safe and tasteful. Enter the costume contest after the race to win an electrifying prize. Packet pick-up and race day registration will be on Friday, November 18, 2016 at 9:00 a.m. and end at 8:00 p.m. at NV Energy located at 7155 Lindell Rd. Join us at 5:00 p.m. for entertainment, a raffle and a dove balloon release in memory of our fallen linemen. *Only those who register by October 31, 2016, will be guaranteed a T-shirt. Afterwards, T-shirts will be given as supplies last. Virtual runner race packets will be mailed out on November 4, 2016.